Our Performing Arts workshops provide members with a supportive, inclusive and creative environment to engage with various art forms including Drama, Music, Dance and Vocals. Each workshop focuses on the artistic goals of individual members, fun activities, and performance opportunities. All our workshops are facilitated by professional artists who are deeply respected in the Queensland arts ecology. If you would like to see any of our workshops in action before enroling , please call us on 07 3505 0311 to arrange a free one-day trial. To enrol, please contact the Access Arts office via phone on 07 3505 0311 to ensure the workshop is right for you and to discuss fees. Then fill out our online enrolment form. Theatre & Dance Ensemble is a skills based workshop integrating a variety of contemporary performance outcomes including creative movement, stage craft, improvisation and favourite drama games. The workshop will meet once a week at Brisbane Powerhouse, and will be under the guidance of professional arts practitioners. Tap into your natural rhythm and journey into an experience of diverse cultural sounds and tempos through exploration of percussion and voice. Become ‘one’ in the circle and discover how to play the drums like you never have experienced before! 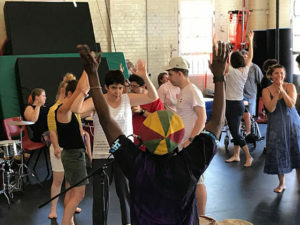 This workshop will meet once a week at Brisbane Powerhouse, and will collaborate with the Theatre & Dance Ensemble for one hour. The renowned Access Arts Singers are always seeking new and enthusiastic members who want to explore vocal techniques. Presenting their work at events with Queensland Music Festival, QPAC and State Library of Queensland, this is a great opportunity to perform in a supportive and fun ensemble. Our ensemble enjoys creating original songs, learning new songs and requesting old favourites.